My girlfriend, D’yani , gave me Weeknights with Giada cookbook last year for my birthday and it’s my absolute favorite! She has a Shrimp and Sausage Cioppino recipe that I used as a base to start and then I tweaked and added some things in my first attempt to this beautiful one pot dish. My hubby said it was an absolute treat for him when he walked in the door and knew something special was on the stove, so enjoy! In a separate medium sauce pan, cook your rice and set aside. In a Dutch oven or large saucepan, heat the oil over medium-high heat. Add the shallots, garlic, 1/2 teaspoon salt, and 1/4 teaspoon pepper. Cook, stirring occasionally, until the vegetables are slightly softened, about 4 minutes. Add the sausage and break into 1/2-inch pieces with a wooden spoon. Cook until brown, about 5 minutes. Turn up the heat and add the wine and scrape up the brown bits that cling to the bottom of the pan with a wooden spoon. Stir in the tomato paste, chicken broth, and bay leaf. Bring to a simmer, cover, and cook for 10 minutes. Uncover the pan and add the clams, basil, and thyme. Wait for them to pop and then drop your shrimp in. Simmer, uncovered, until the shrimp are pink and cooked through, about 4 minutes. 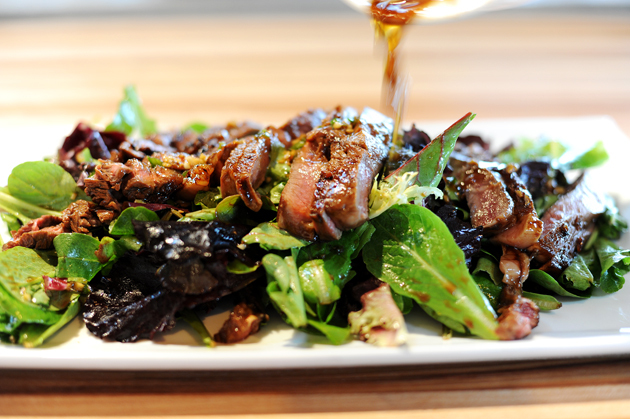 Remove the bay leaf and discard. Season with the remaining 1/2 teaspoon salt and 1/4 teaspoon pepper. 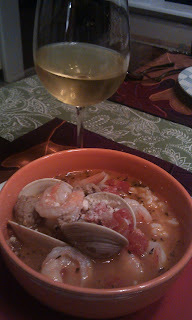 Drop a ¼ cup of rice into your soup bowls and then ladle the Cioppino on top and serve with crusty bread. Hardly few recipes of shrimps turn out to be tasty and yours is one of them. The recipe is easy to follow and you have written it well though the font is too tiny to read.